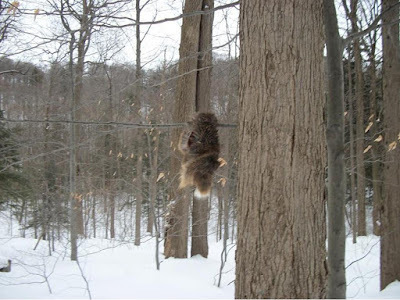 On March 27, 2019 I posted the following account - Bigfoot Observed Near Green Lakes State Park, NY. Since then, I have received a few other sighting accounts at the same general location. I received a telephone call from DV in reference to an encounter that he and friends had in the summer of 1981 while camping along the Erie Canal adjacent to Green Lakes State Park. DV stated that they had been in their tents at around 1am when a barrage of stones and trees limbs began. The group believed that there were 3-4 Bigfoot creating the ruckus. They were able to see shadows and heard grunts during the melee. No one was injured, but the group quickly gathered their gear and left the area. I took these photos in late February 2015. I was hiking in a New York State park near Syracuse NY (Green Lakes State Park). The park consists of two lakes created as spill basins at the end of the last ice age, both meromictic lakes. February 2015 was the coldest month on record here, and the second snowiest. 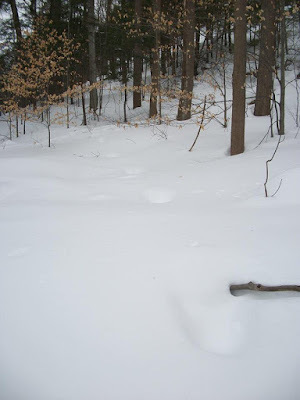 The day I was out hiking was in the single digits, and the snowpack off the trail was between two and three feet deep. I noticed the tracks crossing my trail when I was walking between the two lakes. The incline where the tracks went is about 30 degrees. 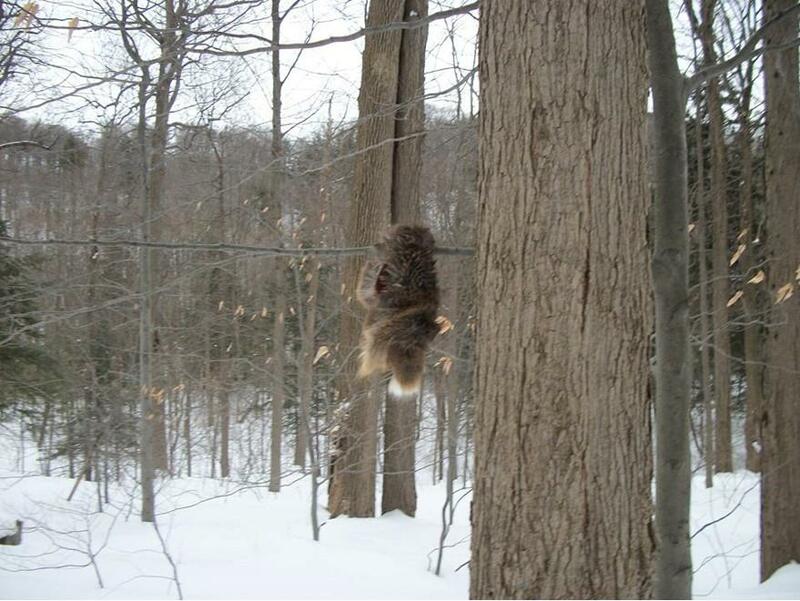 Where the tracks crossed the path, there was a piece of hide draped over a tree branch at head height. I think it is a partial deer pelt, you can see fresh meat on under side. There was no kill site, and deer season up here is in November. The tracks were about 18 inches each, and just over five feet for the distance between them with deep depression in the snow pack (not something you could make in deep snow with snowshoes, and walking with a 60 plus inch gait in them uphill). The tracks had been snowed in, so no crucial detail was unavailable. My one skeptical hunch was that a large buck was prancing uphill in the deep snow, making what looks like Sasquatch tracks, but that doesn't explain the hide on the tree where the tracks cross the trail path.